The iconic actress recently spoke to fans at an event honoring Ed Sullivan. As Diahann Carroll celebrates her 82nd birthday today (July 17), the legendary entertainer is still dazzling fans. Recently, Carroll visited the nation’s capital for The March on Washington Film Festival: ten days of film, music, scholarship and the arts, showcasing the unsung heroes and untold stories of the Civil Rights era, as well as contemporary activism. The Raben Group galvanized African-American women, including executive producer Isisara Bey, and GreiBO founder Shelonda Stokes, to line produce the annual festival, which runs through July 22. The Tony, Emmy and Golden Globe award-winning actress and songstress, was perfectly coiffed and chic in a black pinstripe pant suit during a special festival session dubbed Ed Sullivan in Black & White at The Naval Heritage Center. The crowd cheered Carroll, as she waved and smiled. The discussion explored how Sullivan’s groundbreaking variety show (which debuted in 1948 on CBS and aired until its cancellation in 1971), The Ed Sullivan Show, helped break down racial barriers and usher Black artists into mainstream American culture. “It was a glorious time,” said Carroll of being on the show nine times. “Ed was one of those [special] human beings.” Each Sunday night for an hour, upwards of 75 million viewers tuned in as Sullivan presented “a really big show” with comedians, dancers, puppets and acrobats, to singers performing opera, show tunes, and rock and roll. In an era of overt racial discrimination, the show and its popular host provided a national platform for Black talent, often amid pressure from reluctant sponsors, network censors, Southern TV stations and irate white viewers who sent hate mail. Sullivan showcased acts audiences had never heard of that are household names today —and he treated these artists with grace and dignity back when racism was the norm, challenging the country to do the same. Diana Ross, The Jackson 5, Marvin Gaye, Lena Horne, Smokey Robinson, Nat King Cole, Harry Belafonte, Pearl Bailey, Sammy Davis Jr., Sarah Vaughn, James Brown and Ray Charles were among the talent who appeared. Now there’s a documentary in development called Sullivision: Ed Sullivan and the Struggle for Civil Rights. Margo Precht Speciale, granddaughter of Ed Sullivan, and Suzanne Kay, Carroll’s daughter are the producers. They are partially crowdfunding the project. 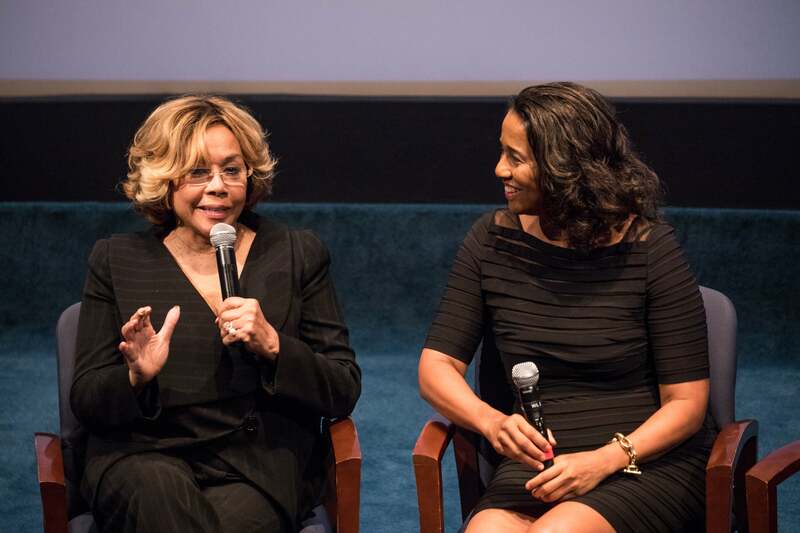 The filmmakers joined Carroll for a conversation moderated by radio producer/host Jacquie Gales Webb, and fellow panelist Dr. Dwandalyn Reece, a curator at the Smithsonian’s National Museum of African American History and Culture. The audience was given an opportunity to preview a teaser from the forthcoming documentary. Carroll grinned at her daughter and quipped, “It’s my first time seeing this.” The film will tell the story of a humanitarian who changed the face of popular culture and the performers and viewers whose lives were deeply impacted by the show. Based on interviews with celebrities and Sullivan’s family members, as well as media analysts, the documentary will bring to light a little known chapter in America’s struggle for racial justice. The filmmakers say that Carroll, Belafonte, Berry Gordy and Oprah Winfrey are some of the stars they plan to interview. Indeed, Carroll’s life was changed when the Bronx, New York native was discovered after winning a nationally-televised talent competition. She went on to co-star in such major studio films as Carmen Jones and Porgy and Bess, featuring Black casts, and on Broadway. Carroll also shattered stereotypes while playing a nurse and widowed mother raising her young son on the `60s television series Julia. Later, she won fans for her portrayal of Dominique Deveraux on Dynasty. There were several revelations during the panel discussion. Carroll —who’s been married four times— shared that she remains friends with onetime love, Sidney Poitier, whom she mentioned is dealing with some health concerns. She also noted that decades ago while on Julia she and her “New York lawyers” negotiated salary and percentage rights to her show at a time when that was practically unheard of for performers, especially African Americans and women. The legendary diva, now a grandmother, also noted how difficult it can be for working mothers. And she reminisced about being with celebrity friends who joined the massive crowds at the historic March on Washington in 1963. Activist Belafonte had been instrumental in making sure Hollywood was well represented, said Carroll. For more information on The March on Washington Film Festival go to www.marchonwashingtonfilmfestival.org. For details on the documentary go to www.EdSullivanDoc.com.